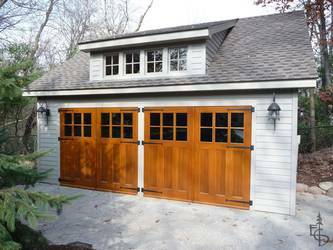 Do your carriage garage doors swing out to open? Do you build entry doors to match your carriage doors? Can you build carriage doors for a double-wide opening? Do your doors come in paint grade and stain grade? 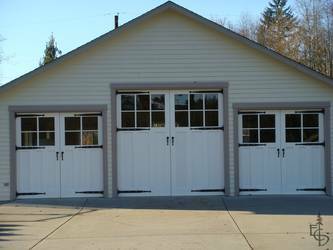 What finish do you recommend for carriage doors? Are the doors pre-hung, pre-drilled or mortised for hardware and hinges? 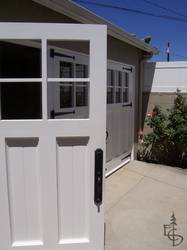 How hard are hinged carriage doors to install? 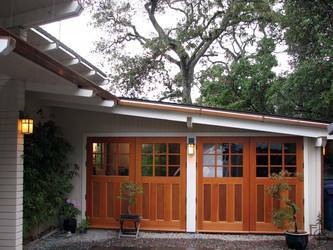 How weather tight are swing-out garage doors? How do your carriage door opener mechanisms work? How much do carriage doors cost? Yes! Evergreen crafts side-hinged and sliding carriage and barn doors. They add authentic beauty and authentic function to the character of your home. Carriage doors leave the inside of your space free for what you want it to be. Yes. Evergreen's entry doors are crafted using the same beautiful wood and hand-made techniques that make our authentic carriage doors distinctive. 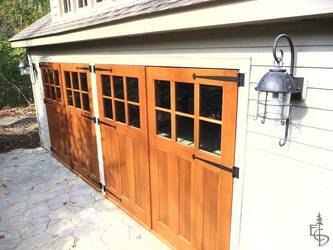 Evergreen builds to fit your garage door opening sizes, up to 10' wide by 9' high. Each door is custom-crafted for a specific customer. We do not stock an inventory of standard doors. Carriage doors are for single-car openings. If you are replacing a double-wide door, you will most likely need two sets of swing-out doors with a post in the middle. Another option is a three-door set like this. Contact us for ideas and options that will work for you. Evergreen chooses fine materials for the strength and durability required in a functional swinging door. All carriage doors produced in our shop are ready for a high quality exterior finish of your choice, either stain or paint, we build them to the same high quality. 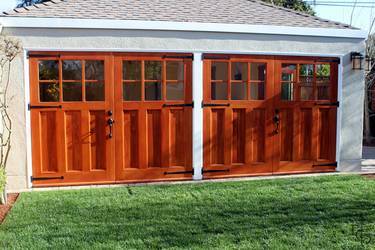 Your carriage doors should be completely sealed and finished prior to installation so that they are not exposed to moisture when they are raw. If a painted finish is desired, we recommend a top-quality oil based primer, and either oil based or latex paint -- of a light color (to avoid absorption of excessive heat). If a stained finish is your choice, a high quality stain and finish such as Sikkens Cetol Door and Window Finish is excellent. Evergreen does not paint or stain the doors at our shop. Most of our customers are matching their finish to other doors or trim on their home. Often those who thought they would be painting their doors change their minds when they see the beautiful wood grain of the carriage doors. The doors come sanded to 100 grit. If a finer finish is desired, Evergreen recommends a final finish sand prior to applying any finish. Evergreen's carriage doors do not come pre-hung. Because of their size, it is best - both less expensive and safer - to ship them as individual doors. There are many options of hardware choices, depending upon your preference and the function of the doors. Since your installer will likely do some planing in the installation process, we do not pre-drill the doors. 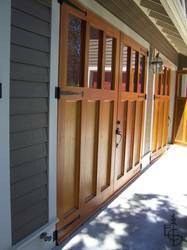 Your contractor or a licensed carpenter can handle the job of installing swing-out carriage doors. Many of our handy customers have installed the doors themselves. Evergreen provides complete instructions, and is available by telephone to guide you through the process. The heavy duty automatic door opener that Evergreen Carriage Doors offers mounts on the door header and pushes the doors open with a flexing elbow-action. 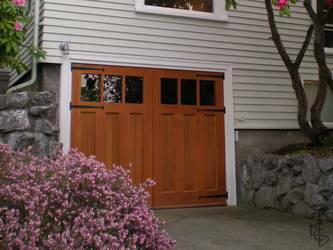 Evergreen Carriage Doors prices doors according to the size of your door opening, and the style of the door you choose. We have 8' x 7' carriage doors starting around $3595 for a set of two doors. Evergreen is a cottage industry, based in the Northwest. Beautiful vertical grain Douglas Fir is plentiful and economical here, and we pass those savings on to our customers. We received the doors. All five were intact. They look great. Thank you very much. We appreciate doing business with you. Thanks so much for all your help. The doors are beautiful… Thank you very much. It's also been our pleasure working with you. How pleasant and easy to transact with you. The carriage doors are absolutely stunning....more so than I ever imagined. Thank you so very much for doing such a wonderful job....but I imagine that all your doors are equally as beautiful. Our house will look like a million dollars! Can't wait until the studio space is finished and I can really go to work (or rather, have tons of fun!). They are really beautiful and make the house. I love the doors and everyone who comes here compliments them. My brother is an engineer (formerly a carpenter); he saw them this summer and was very impressed. My friend, who is the contractor who installed them thinks they're great, as well. In fact, his carpenters even said they loved working on the installation because they were so great.